Genetically Modified Foods… What Are They? Genetically modified (GM) foods or Genetically Modified Organisms (GMO) are plants or fish that have had their DNA altered by genetic engineering techniques. Bacteria and viruses are introduced into their DNA to make them grow faster, larger, and disease resistant. The GM plants have built–in pesticides. We have been eating GM foods since the mid-1990s. The main GM foods are soy, corn, canola, and sugar beets. Scientists have repeatedly warned us about the dangers of GM foods. GM foods can create unpredictable side effects that may not be obvious at first, but can manifest in allergies, new diseases, and nutritional deficiencies; as well as liver, intestinal problems, tumors, and organ damage. Some GM crops have been linked to sterility and death. Please view the video/articles on the Mercola.com website. They have several articles on GM Foods and the dangers. Over 50 countries in the world including China, EU, and Russia have strict labeling laws for their GM foods. We are one of the only industrialized nations that do not require labeling of GM foods. In the US, our citizens are unaware of which foods contain GM organisms and which do not. California will be the first state to address the GM foods issue. The California Right to Know Genetically Engineered Food Act is simple: The initiative would simply require food sold in retail outlets to be labeled if it is produced through genetic engineering. California Proposition 37 (Yes on Proposition 37) is a campaign to label genetically engineered foods in California. Californians will be voting on this proposition on their November 2012 ballot. Even if you do not live in California, encourage your friends and family that live there to vote “Yes” on Proposition 37! We have a right to know whether our food contains GMOs. If Proposition 37 would pass, that would be a huge step for our country to begin labeling GM foods. We must label these foods so we can make informed choices. As more evidence becomes available about the dangers of GM foods, I am hopeful that our citizens will say “no” to this type of food production. Genetically altering whole foods and animals are not natural. The aftermath of this giant experiment that we have been participating in since 1995 will have long term effects for generations to come. We have a right to know what is in our food system. People are starting to realize that we need to take responsibility for our own health and well-being. More and more people are shopping at farmers’ markets and planting their own gardens. The farmers’ markets that I visit have had a steady increase in crowds over the last few years. I am thrilled to see such an interest in growing our own food! I work with a local school district’s “Good Food Project.” They have a greenhouse that produces a surprising amount of produce that they use in the school lunch program. 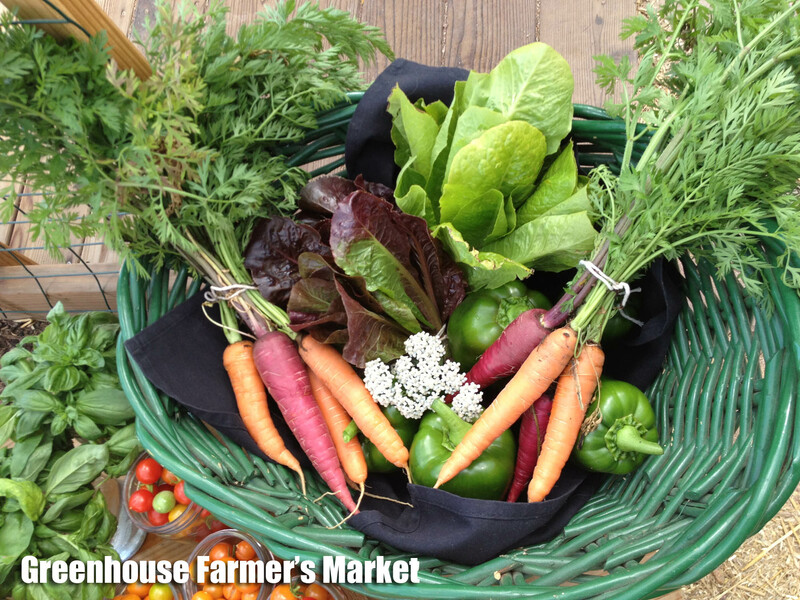 The above picture was from the first “Farmer’s Market” from the greenhouse! I am proud to be a part of a school district that values health and proper nutrition for their students! The following pictures are from my little garden. I am growing beets, potatoes and tomatoes. It is an absolute joy to pull food out of the ground and cook it up in the kitchen!! I am so passionate about helping people find better ways to stay healthy, by eating well, exercising, and discovering your true self. Continue to grow everyday ~ knowing that each new day brings an opportunity to learn! Take care friends! Eat well, play, get plenty of rest and love one another! This entry was posted in Health & Nutrition and tagged farmer's market, GMO, health, home gardens, nutrition, Proposition 37. Bookmark the permalink.